Not much information exists for this title. It was listed in the March 1991 issue of Gamepro, and stated it would be similar to Ghouls 'N Ghosts. I could not find a single game by Hudson that matched that description on any system. According to Gamepro, it was supposed to be released in September 1991. 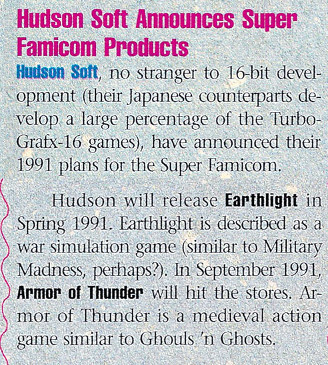 Announcement of the title in the March 1991 issue of Gamepro. Scan courtesy of Retromags.